Crown molding gives any room in your home a finished, polished appearance. These detailed moldings install at the area where the ceiling meets the wall, but can also be used to finish cabinets, bookcases and door frames. 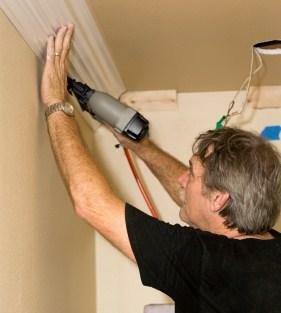 True crown molding can get expensive, though, particularly if you are running it around an entire room. Consider using any of these inexpensive crown molding options if you need to save money while sprucing up your home. There are a few different types of inexpensive crown molding. Not every type is created equally, or suitable for every project. Know your specific needs before you buy to make sure one of these options can complete your job. Polyurethane, or Styrofoam, is a lightweight foam that can be shaped, molded, primed, painted and cut. It can form several different shapes of crown molding and is suitable for use in wet areas and outdoors. Depending on the manufacturer, you may be able to install it simply by gluing it up, although many types are installed like traditional moldings and are nailed. Inexpensive - Polyurethane moldings can cost as little as $1 per linear foot. Lightweight - These moldings are very easy for one person to handle. Easy to cut - Polyurethane does not splinter like wood, so if you are a novice at cutting moldings you won't have to worry about broken ends. Appearance - Polyurethane moldings look fine from a distance, but for those going in areas that are seen up close, they do not appear like the real thing. Not Eco-Friendly - Polyurethane is not a green or renewable material. WishIHadThat sells pre-primed moldings in lengths up to 8-feet. 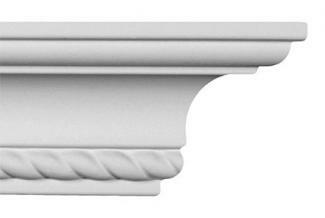 They have several decorative corner pieces available, and their moldings are a chunky 3-inches in width. Prices start at around $7 per piece, and they offer free shipping on all orders over $50. WishIHadThat is also known for their excellent packing job, which will ensure your lightweight moldings arrive in one piece. DecorativeCeilingTiles carries plain and decorative moldings in lengths up to 6-1/2-feet. Their moldings are glue-up and come ready to paint. Prices start at around $15 a piece. The customer service at DecorativeCeilingTiles will help assist you in finding just the right molding for your job if you're having difficulty deciding what product is right for you. MDF, or medium-density fiberboard, offers another option for inexpensive crown moldings. MDF moldings are made of layers of wood pieces glued together under intense heat and pressure. The result is a lightweight, dense and inexpensive crown molding that can be primed, painted and installed like wood. Lack of grain and knots - MDF moldings are extremely smooth with no grain or knots so they give consistent appearance, while also being easy to cut and handle. Lightweight - While not as light as polyurethane, MDF is lighter than wood moldings, making them easy for one person to install. Detail - MDF moldings are available in a wide range of different styles and details to complement a range of decors. Less character - While a lack of grain can be beneficial to some jobs, it can detract from others because the moldings have no variation or character. Formaldehyde - MDF is produced with urea formaldehyde, which it gives off when cut, potentially making it dangerous to your health. Splitting - MDF can split when being nailed or screwed during installation. 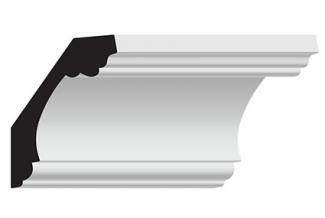 Burton Moldings produces dozens of different profiles for crown molding in MDF. Pricing begins at just .70 a linear foot, with moldings coming in 16-foot lengths. Burton Moldings is also well known for their customer service; no matter how small a job you are doing, they will work with you to ensure you get just what you want. Menards carries several profiles of crown molding in MDF. Pricing begins at around $7 for an 8-foot length of molding. In addition to selling you a great product, Menards will also show you how to install it, and offers attractive credit terms for qualified customers looking to do larger jobs. To further reduce the price of hardwood moldings, look for thinner profiles; thick profiles will often be double or higher the cost of thinner moldings. 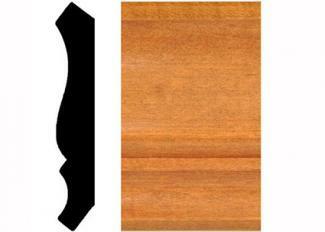 Character and grain - Hardwood has grain, knots and texture that man-made materials lack. This is particularly beneficial if you plan to stain, rather than paint, the moldings. Durability - Wood that is treated and installed properly can last as long as your home does. Weight - Hardwood is heavy, and can be more difficult to install for the novice homeowner. Splintering - Cutting hardwood moldings can take some practice to avoid the splintering that can occur when the heavy end pulls away during the cut. World of Moulding carries many different species of wood and profiles, some of which are as low in cost as .71 a linear foot. World of Moulding also prescreens contractors who work with their products, so if you don't plan to install the moldings yourself, they can help you find someone who can. The Home Depot carries several species of wood crown moldings with prices starting at around $8 for a 96-inch piece. Have your molding sent right to a store near you for pick up and avoid pricey delivery fees. Crown molding adds the finishing touch that many newer homes are lacking. Put up some inexpensive crown molding and give your home the attention to detail it deserves.